Spoonflower have announced another free shipping day (international shipping, too)!. 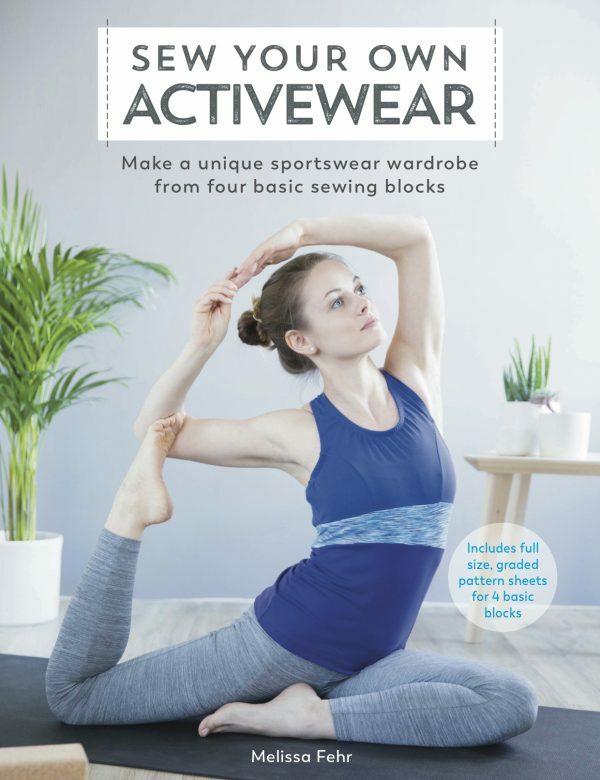 This is a perfect opportunity to try out our Fehr Trade x Laurie King exercise fabrics if you haven’t already. 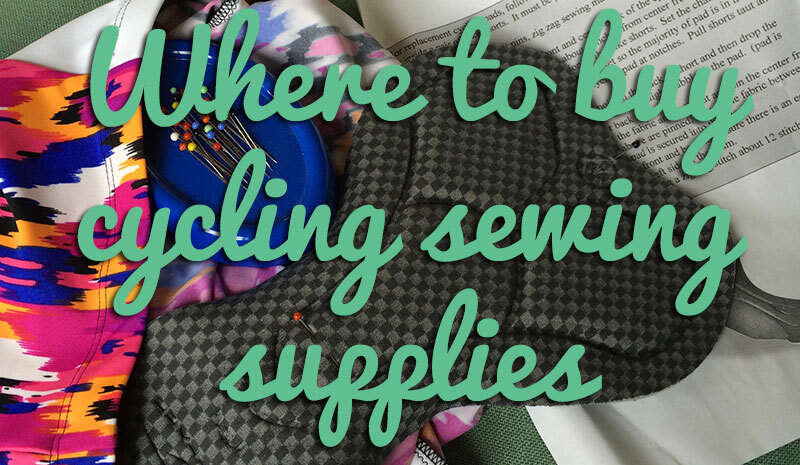 The fabrics coordinate perfectly with my sewing patterns so you only need to buy one yard of wicking fabric to get coordinating colours and prints. 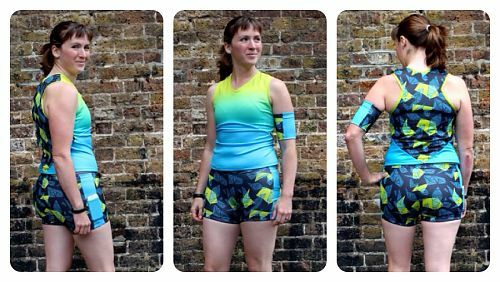 Seen above, the VNA Top and Duathlon Shorts (booty length) in the coordinating “Maps” citrine & black colourway. For UK buyers, this means you save $9 on shipping, and if you buy one yard of the Performance Piqué it should fall under the HMRC exemption and you won’t get hit with nasty surprise customs charges. 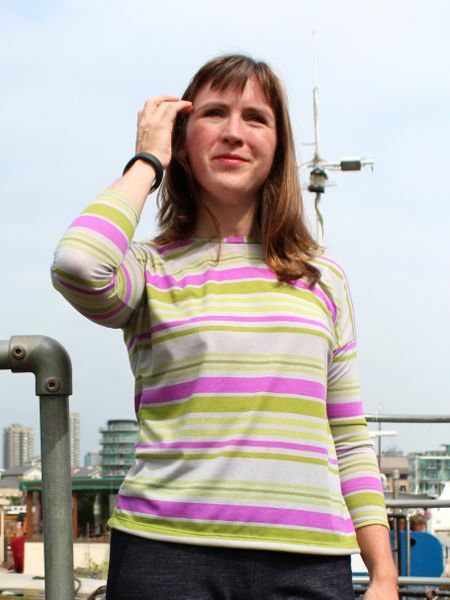 Next Thursday evening I will be teaching the Slouchy Breton Tee class at the Thriftystitcher studio in Stoke Newington (London), and there’s still space for you to join! This class uses a pattern drafted exclusively for the class, and has the magic ability of fitting everyone I’ve taught so far without needing an FBA! Magic. Stripey fabric is provided just you just need to turn up and enjoy learning the stretch fabric basics, and go home with your own tee and exclusive pattern. OMG, it’s the return of the Great British Sewing Bee, but with a twist! 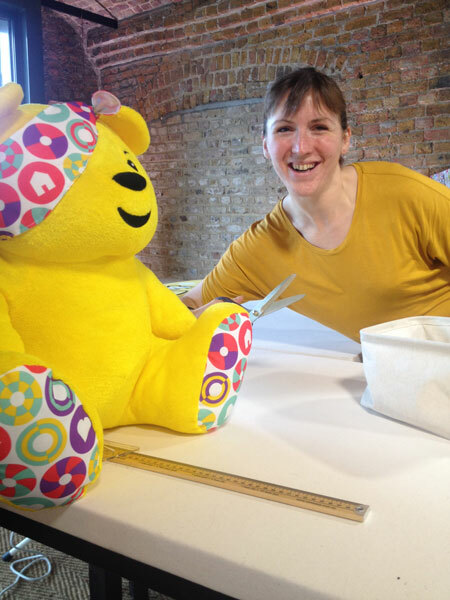 The first of three charity specials for BBC Children in Need airs at 8pm, featuring celebrities who have never sewn before, going through a set of three challenges. Dum dum DAH! I’m super excited for these to air because, well, I may have spent half my summer working behind-the-scenes on these (there’s a blog post ready for when I’m able to post it! ), so I can’t wait to see the finished episodes! Also, I can confirm that these Pudsey ironing board covers are super cute! Serious bargain at £10 (for charity! ), if you ask me. Stretchtacular Day! Come to the Thriftystitcher Studio and learn to sew your own leggings in the morning and a slouchy Breton tee in the afternoon! You could indeed wear both home, should you be so inclined (I’ve had many students do just that…). Or you could choose to do either class individually, too. There are nice cafes and pubs just round the corner for a break at lunchtime, or if it’s a nice day you can pack a lunch and eat it in nearby Clissold Park, too. Edit: the workshop has been moved to 2 Nov to better accommodate 9-5 workers! 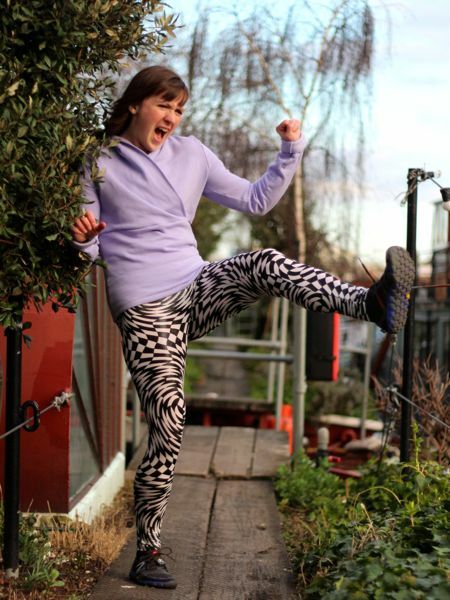 Cult running magazine Like the Wind are holding a week-long popup in Shoreditch (London) with a series of workshops, talks, films, and… a sew-your-own-leggings class, taught by yours truly! My Acid-trip leggings producing “an effect”! This class will have a running focus, so I’ll talk about things like wicking fabrics, chafing, seam finishes, and other design considerations specific to activewear, and you get to choose your own fabrics, too. Leggings! Everybody loves leggings! Come and learn how to deal with stretch fabrics and sew your own in an evening with me at the Thriftystitcher Studio. 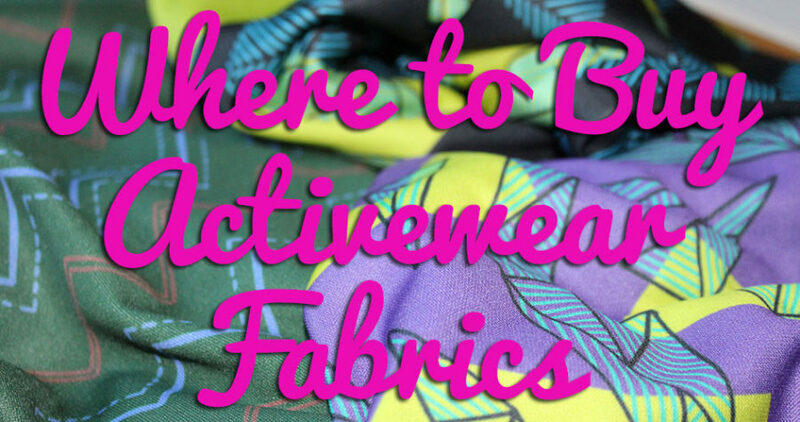 You get to choose your own fabric and use the overlockers (not-so-scary “overlords”, no! ), and come home with your very own pair plus a pattern to make as many as you want at home. If teeshirts and leggings seem too daunting, perhaps dainties hold more appeal? In this class at the Thriftystitcher Studio, you’ll learn the basics of lingerie sewing, including a clean-finish crotch lining, applying lingerie elastic, and using different types of lace. We’ll be using my Lacey Thong pattern or a new Lacey Brief pattern I’m developing from the Runderwear base pattern, so you have your choice of style! Phew! And… I think that’s everything. Happy weekend everyone! Separator image Posted in Inspiration and tagged with exercise, knit, lingerie.